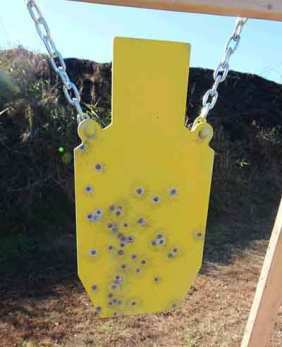 What Are The Best Steel Targets For Handgun Shooting And Training? Standing in my back yard with AR500 steel handgun targets behind me is a new platform for an information video. 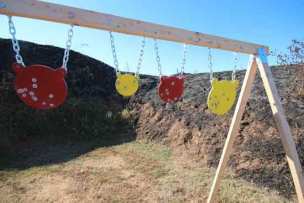 But the question of which steel targets are "best" for handgun shooting and training is a never ending quest of people considering this for a new type of shooting. While in my other videos you see us running and shooting the targets, but with little information about what they are, or where they came from. Here you get the details for the questions most people will ask when choosing their steel targets. I'll explain what we've got, how we have them set up and how we use them. What Is The Best Steel For Pistol Targets? So you know what to look for without forever searching and comparing, get 3/8" AR500 steel. Follow the guidelines for shooting it. The stuff is virtually indestructible. What About The Range And Safety Of Steel Targets? This is not a recommendation, just a report. We shoot ours as close as eight (8) yards with no damage to the targets and no safety issues. That's with 9mm - 45ACP. With .44 magnum we back off just a bit more; but mainly to keep from pitting the targets. Even then, just ten (10) yards distance doesn't seem to do any damage to the targets with a .44 magnum. For huge bullet sizes, make adjustments to target distance and steel thickness. But with the caliber handguns most people will be using and training with, that gives a pretty solid description of what they'll take. People want to know, "Which targets will give me the best ring?" The answer is, there is no clear answer. Steel gongs will all sound a bit different. From target to target, mount to mount, bullet to bullet, they will all have a distinctive sound. If you want the best chance for an AR500 steel target to ring, get a gong. But don't get hung up on the sound. Just get one or two, or ten, vary the way and how tightly you hang them, and enjoy the multiple sounds. You'll embrace the feedback from all the rewarding sounds. All the targets in the video and the pictures here are advertised as "gongs". The ones on the posts below are eight (8) and ten (10) inch gongs with a single mounting hole. They are made for single post mounts that are highly portable, both to transport and to move around on the range. They can be set up on single post stands like the ones in the picture. They are stable, noisy (what you want), and mounted at a slight downward angle, deflect bullet fragments down, not out. The targets to the right are gongs with dual mount holes made to hang from chains. That doesn't mean you can't hang them other ways, but chains or rubber strap hangers are the intended method. Targets suspended from hanging chains can be lined up for a pretty entertaining and important training tool. They are commonly hung on cross boards with 2x4 saw horse brackets/boards for legs. An alternative to that is the two I mounted on this one post. The larger bottom steel gong for a body shot, the top for a head shot in tactical training. It works great as you see mounted. In the video, you'll see my daughter running through multiple targets, dropping down on one knee and shooting fast - two to the body, one to the head on this target setup. The feedback is priceless for your practice training. 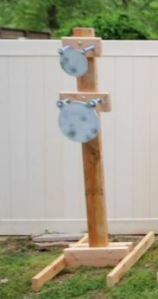 The AR500 steel gong targets with dual mounting holes for suspending them, above came from shootingtargets7.com. My first choice in steel targets. Their excellent customer service, simple, high value, turnkey systems, and reasonable pricing puts them first on my list to check for my pistol training target needs. A word about hanging gongs like the ones on chains above. You'll find it's better to hang heavier (8 inch or larger) gongs like that, rather than small ones. The smaller ones jump around on the chain like a live animal caught in a snare. Trying to re-target them is difficult until they stop moving. The larger gongs just shake a bit. You can get right back on target after a first shot strike. The big silhouettes, like the one shown, are great hung alone from a single mounting stand. The target gives good feedback, moves very little, and is easily transported and moved around on the range. These can also be purchased in multiple sizes, designed for different mounting methods. They can also be mounted to posts with single hole mounts at the top. Either dealer mentioned on this page can provide good, AR500 silhouette targets to add to your steel shooting gallery. NOTE: For any targets you choose, look into mounting hardware from the steel dealers. Especially if you'll be hanging your targets from chains. If mounting to a wood post, getting the hardware from building supply stores is fine. When you visit the places that handle the steel targets you're going to find all kinds of "systems" you can set your targets up with. Some of them are very portable. They're very convenient. They're very fast to set up. The manufactured steel target stands are also very expensive. That's the reason that instead of buying stands and bases for them, I use wood that I make my target stands from. You'll see what I'm talking about when you go in to look at the steel targets. But, for those of you for whom that's not an issue, they will have stands and target systems for you that will fold and stack into a space that will take up only a portion of what you will use with wood stands. If you decide to save the expense and make your own wood stands and bases, you can find a ton of YouTube videos that tell you how to make them. And they are portable enough to stack plenty of them in a six foot pickup bed, along with plenty of other target stands. What you see behind me in the video will all fit inside my 6 foot pickup bed, in addition to target backing, plywood, self sealing silhouette targets, etc. So, for those of you who need portable targets and stands, these will work, along with your own wood stands or manufactured stands and bases. If you haven't shot steel before, when you start, it will likely produce motivation you never had before. 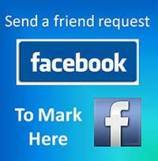 For handgun shooting and training particularly. The feedback from steel targets is unparalleled by most anything else you will shoot and train with. It will help you improve your handgun shooting. The targets, when used reasonably, will last virtually, forever. I don't know exactly how long it takes to wear out one of these AR500 steel targets out, because I've never actually known of one to be worn out or ruined by typically instructed shooting. AR500 steel gongs, silhouettes, shooting systems for handgun shooting and training. Once you get it and start, you won't regret it and you won't turn back. It will help you improve your handgun skills forever going forward.